Lucy Troyer is traveling alone, by train, to go to her cousin Mattie in Jacob’s Crossing. Mattie has just been diagnosed with breast cancer and is having a rough time with treatment. Lucy hopes that she’ll be able to help out and encourage Mattie through this fight. While traveling, Lucy meets an Amish man, Calvin Weaver and his sister, Katie, who are traveling home to Jacob’s Crossing. They decide to stay together since they are going to the same place. Lucy is attracted to Calvin—at least until she witnesses him yelling at a carriage driver. Since Lucy had been married to an abusive Amish man, she decides to stay away from Calvin and his anger. But with their travels, living in the same town, and being virtual neighbors, staying away from Calvin is almost impossible. Is it possible that going to Jacob’s Crossing is a time of healing for Lucy? THE CAREGIVER is the first book in Ms. Gray’s newest Amish series, and I am looking forward to reading the next two books in the series. Some of the characters in the other stories have already been introduced, with bits of their stories shared, in their points of view, in this story. I enjoyed getting to know Lucy and Calvin and getting to know them. Mattie’s point of view was a bit depressing as I’ve been where she is, and it brought back some memories. Lucy is a bit depressed, but coming from the background she had it is acceptable. It was nice seeing her spirits lift and a bit of life come back into her as the book progressed. Discussion questions and an excerpt from book two, The Protector, is included at the end of the book. $12.99. 286 pages. Congratulations to Beth Bulow for winning a copy of Penny Zeller's book, Hailee. The world we live in believes that the more we have, the better off we are. We’re striving for bigger paychecks so we can have that fancy bass boat, the big house in the good part of town, designer shoes, and our sixteen year old daughter can dress live a diva. But all that it really does is bring more stress into our already stressed lives.
. I’m tired of living with constant stress.
. I feel disconnected from my spouse and kids.
. I want to laugh again.
. I’m earning more, but I feel like I’m living less.
. I’m tired of rushing from one activity to another.
. I wish our family could sit around the dinner table talking and laughing.
. There are not enough hours in a day.
. There has to be a simpler way.
. Identify a long-term vision for your family.
. Show the attitudes you need to adopt to make that a reality.
. Share action steps to make small and big changes.
. Determine if its feasible for one parent to stay home.
. How to live on one income. If you want more time for your family and less stress, then LIVING ON LESS SO YOUR FAMILY HAS MORE is a book that you will want to read. I highly recommend it to families that are looking to cut back and live a quieter life, yet one where they can develop relationships with their family. Discussion questions are included, as well as notes. $12.99. 210 pages. 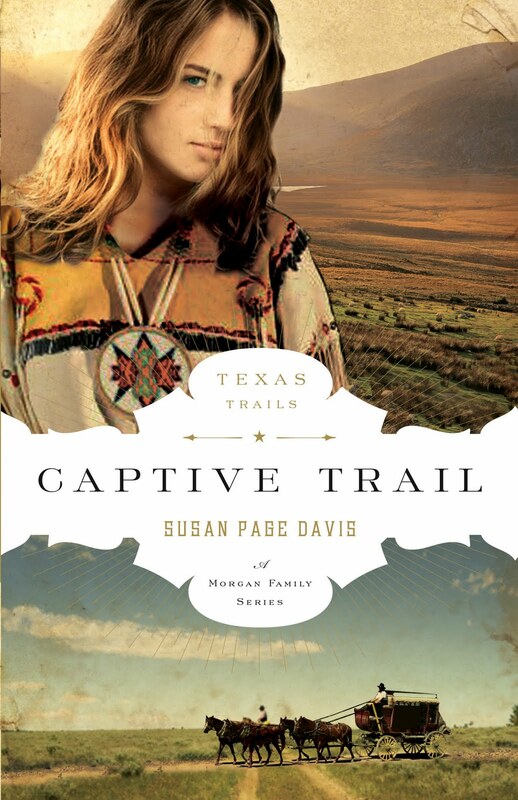 Congratulations to Patricia Blackmon for winning a copy of Susan Page Davis' Captive Trails. Is it possible to share a loved one’s passing from this world to the next? Dr. Moody has collected several stories of passings, when the dying person’s loved ones who are gathered around them accompanied their loved one part way on their trip to glory. Or their loved one shared the experience in some fashion, such as seeing their loved one’s life passing—even things they didn’t know about. He shared about how sometimes the spirit lingers and things said might hurt them. And he mentioned how deceased loved ones sometimes came back to accompany them through a ‘tunnel’. I was of the opinion that these things (at least most of them) happened anyway, because when my mother died, she saw my father quite clearly, and he’d died many years before. She told me—even though she’d lost her speech due to a stroke—quite clearly that Allan was there. I looked around and didn’t see him, but I have no doubt Dad was present. I also know that Mom’s spirit passed through my house on the way to Heaven, because I knew a full ten minutes before I was called that Mom was gone. I wished I’d stayed at the nursing home with her. But her death was unexpected. GLIMPSES OF ETERNITY is a book that completely validated my experience with a loved one’s passing, and gave me glimpses into other peoples’ experiences. If you have a loved one dying, or shared an experience similar and wondered if it was unusual, or just wondered about the afterlife, near death experiences, or what it’s like to die, then GLIMPSES OF ETERNITY is a good book to pick up. Good for hospice workers and other medical workers, and church libraries. $19.99 hardcover. 183 pages. The heiress daughters of newspaper magnate August Price have been given everything their hearts desire. But what if they want only to be loved—without an enormous price tag attached? Esme is tired of society. She wants to write for her father’s paper, but she’s a woman and expected to marry a good match. She’s being courted by one man, but her heart yearns for another. Esme gets around the writing rules by writing under a penname, and she is being published—without her father knowing who she is. But will she be able to keep this dream—or forced to give it up? Jinx is in love with her sister’s beau. She is not officially out in society, but she dreams of when she can be. She doesn’t think Esme deserves Foster, and she is determined to do whatever it takes. But will Foster give her happiness? HEIRESS is the first book in Ms. Warren’s Daughters of Fortune series. Set in the Gilded Age, each of the women must navigate the expected roles of woman to forge their own way and try to achieve their hearts’ desires. I was looking forward to reading this book because Susan May Warren is one of my favorite contemporary romance writers –and I even liked her romantic suspense real well. But this book – and her other ones with Summerside Press – were disappointing. I know they are “real life” and not everyone has a “happy-ever-after” but these wealthy ladies were somewhat depressing. There were some real touching romantic moments in both Esme’s and Jinx’s stories. HEIRESS is very well written, but I just wasn’t a fan of this style. Discussion questions are included at the end of the book. $14.99. 367 pages. • How do Esme and Jinx compare to Jacob and Esau? • What lessons do the Price daughters learn that we can apply to our own lives? That being blessed isn’t about what you have, but in the fact that you are loved by your heavenly Father, and that your life is in His hands. • Why did you choose the "gilded age"? How is the "gilded age" defined? The Gilded Age is one of excess and a time when people were coming into vast wealth (while the regular population made very little). The gulf between the rich and the poor widened. However, the high society, despite their wealth, lived turbulent lives, some even committing suicide. If they were “blessed” then why were they so unhappy? This book is a quest for the answer. • Is this story inspired by true stories? • What does it mean to be "Blessed"? There are many “Blessed is he who…” in the Bible. However, I believe all of them come back to that foundational knowledge that seeps through and takes root in a person’s heart, that they are in the hands of a God who loves them. Besides when you came to know the Lord, what is the happiest day in your life? The day I married my amazing husband. Or perhaps the day I gave birth to my first child. Or second. Or third. Or fourth. I think it’s hard to pick because they’re all my happiest, in different ways. Wish you were Here, a book for endorsement by Beth Vogt, one of my Voices from My Book Therapy. It’s excellent and comes out in the spring. Anywhere where I can be with my family. I try and find a setting that will act almost like another protagonist and add tension to a story. Like Minnesota, in the winter. Peter Anderson is a bit floored by the fact that his wife is a red-head when he’s expecting a blond, but he still finds her beautiful. But he’s concerned with the two girls she has with her. How will he support an instant family? But that isn’t the least of his concerns. Peter’s mother, upset by his marriage to a mail-order bride, orders a background check done on his new wife. But what she discovers during the check has the potential to destroy Peter’s and Catharine’s marriage. DEEPLY DEVOTED is another mail order bride story with a different twist. I like all the ways that authors are finding to write these stories so they aren’t all the same. I also appreciated that Catharine and Peter entered into the marriage by consummating it (uncommon in most inspirational novels). And I appreciate that they had a normal newlywed behavior. I don’t really know how to say what else I need to say… except there didn’t seem much else to the plot, other than Catharine’s untold secret. The story is very well told. Very well-written. And as I said above, a unique twist to an old western/historical theme. I also loved the author’s notes at the end of the book. If you enjoy prairie romances, mail order bride stories, or historicals, you will want to read DEEPLY DEVOTED. $14.99. 332 pages. Serena Boyd has epilepsy since she was born, but everyone considered her seizures more evil, a sign that she was demon possessed. Her own father tried to take her away and kill her, but kind-hearted servants helped Serena and her mother escape, where they lived in peace in a village made up completely of misfits. Gavin MacKenzie is a chieftan heir, but he is helping his younger brother get a start with a career. Hired to restore the ancient Castle of Braigh, and protect the new Laird from whoever murdered the previous Laird, Gavin stumples upon a village of outcasts when he rescues the lovely Serena after she falls out of a wagon and is unconscious. Despite himself, Gavin can’t keep his distance from the lovely lass, and Serena is desperate to keep her “falling sickness” secret from the handsome man and from the Laird of the Castle of Braigh. When a fierce enemy launches an attack against the Village of Outcasts, the villagers unit in a bold act of faith. But is it enough to save them? HIGHLAND SANCTUARY is the long awaited sequel to Highland Blessings, but it easily stands alone. I thoroughly enjoyed getting to know Serena and Gavin, as well as the cast of ‘misfits’ that surrounded them. The characters were all realistically developed and interesting. Jennifer Hudson Taylor has penned a heart-warming medieval romance full of mystery and intrigue with HIGHLAND SANCTUARY. This book grabbed my attention from page one and kept it as I hoped Serena would recover from her “falling sickness” and find true acceptance and freedom. The ending came as a complete surprise. $14.99. 332 pages. DEA Agent Paige Ashworth is undercover, trying to find the murderer of her partner and a woman. A little six-year-old boy, Will, might know the answers—the woman was his mother. But Will isn’t talking. At all. Now Will’s uncle, Dr. Dylan Seabrook is raising him. Someone apparently is targeting Dylan and Will. Paige is hit on her bike trying to rescue Will when someone tries to run him over in a crosswalk. She lands in the hospital for her trouble. And now the reporters are on her tail, wanting to interview her. That’s the last thing she wants, since it will blow her cover. But the killer will stop at nothing. Not an undercover cop, a doctor, or a six-year-old child will keep him from his murderous vendetta of keeping Will silence—forever. AGENT UNDERCOVER is the first book in Ms. Eason’s new series, Rose Mountain Refuge. I enjoy reading her longer books with Revell and thought I’d give this one a try. I enjoyed getting to know Paige, Dylan and Will, and figured that drugs would be involved somehow. I also wondered why the killer would be after Dylan since he was simply an uncle, so I had to keep reading to find out the answers. If you are looking for a good suspense novel, you might want to check out Agent Undercover. The ending is sweet. Discussion questions are included at the end of the book. $6.50. 280 pages (large print). Julia Randel was kidnapped at the age of thirteen when she was on the way home from piano lessons. For seven years, she was held captive on the compounds of a cult, but then she witnessed a murder, and had to escape. After two years of living under lock and key at her father’s house, the trial for the murder is about to begin, and the cult leader’s followers want to silence her—permanently. Gavin Shane is a professional bodyguard. Julia’s father warns him away from a romantic entanglement with his daughter, but tells him to take her to a safe house—one that the father has set up. But getting there is a problem. They were followed. And not only that, but no one is at the safe house when they arrive. Not to mention, security there is next to none. I’ve been a fan of Ms. Dunn’s writing since I first read her cozy mystery series, so I looked forward to receiving HER GUARDIAN to review. Suspense is very different than cozy mystery, so there is a different feel to these books, but they are still good. Gavin had failed as a body guard in the past, and there were times in this book I didn’t think he had very much common sense. Who lets a woman in hiding go shopping for perfume? Julia also, at times, acted very immature and selfish. I didn’t fall in love with either of these characters, unfortunately. Still, the writing was good, the suspense—while not page turning—was still present, and the premise excellent. I loved the cover. If you are looking for a romantic suspense, then HER GUARDIAN would be a book to consider. Discussion questions are included. $5.75. 220 pages. You can experience God’s joy every day. God is always with us, in good times and in bad. In A WOMAN’S WALK IN TRUTH, Vonette Bright gives us short (five minute or less) devotionals that explore God’s Word and strengthens your heart. I enjoy reviewing devotionals and this was a short one that made it easy to read in small bits of time. This one is encouraging and upbeat, and included a verse to meditate on as well as a faith-building story, and affirmations that will help to brighten your day. This is a great book to keep for quick five-minute bursts of time with God, when you don’t have the time to give to a more in-depth study. I have devotions several times a day and enjoyed making this one part of my time with God. Attractively done, this book is also excellent for gift-giving. $9.99 hardcover. 288 pages. When I was a little girl, I owned a series of books called Grandma’s Attic, stories about a grandmother when she was a little girl back in the 1880s. Well, now-a-days, little girls’ grandmothers were born in the 40’s, 50’s, and even 60’s, so they don’t get first hand stories about how their great-great-whatever grandmothers used to live. I enjoyed rereading this series, in its entirety, and was glad when I was offered the third and fourth books in this series for review, so I could pass them on to my own little girls. 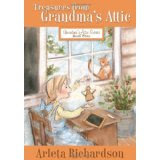 Don’t miss any of the books in this series, Stories from Grandma’s Attic, More Stories from Grandma’s Attic, Still More Stories from Grandma’s Attic, and Treasures from Grandma’s Attic. They are a treasure to read and for young girls to learn about historical days. $6.99. 150 pages. There have been some books published lately, by well known pastors of mega churches who are convinced that Hell is not real, it’s a figment of our imagination, because, really, why would a loving God cast anyone into a lake of fire? Brian Jones used to be a member of that camp, but after an amazing experience when he rescued several people from an apartment fire, Jones began to rethink his position. And after extensive study, he came to the conclusion that Hell is real. Hell is not really a subject matter I was interested in, but when I discussed this book with my husband, he mentioned a well known pastor in the Grand Rapids area (Bob Bell) who has recently released a book declaring that Hell isn’t real—and there is a video trailer out online about it. So then I got curious about what Jones had to say about the subject. Now, I always believed that Hell existed. I was raised in a Christian home. I was taught Bible from the beginning—and that was part of Bible teaching in a full-doctrine church. So, I knew most all the references to Hell. I felt that Jones wrote a very well thought out book about why Hell does exist, and he provided solid biblical proof for its existence. If you (or someone you know) is struggling with belief in this very real place, then HELL IS REAL (BUT I HATE TO ADMIT IT) is a book that you might want to consider getting. It could also be used as a great witnessing tool. Additional notes and resources are included. $14.99. 370 pages. But Hermie still feels bad. He sees an ant carrying a load bigger than he is and he’s jealous because he isn’t strong. He sees a snail and he’s jealous because the snail has a house. But God still says He’s not finished with Hermie yet. God has a special surprise for Hermie. HERMIE A COMMON CATEPILLAR uses simple sentences, basic vocabulary words, and beautiful illustrations to bring across a lesson that God made everyone special—even those who don’t seem to have anything outstanding about them. And this is a perfect level two reader for those children just learning to read on their own. My two daughters loved this book—both my nine year old (an avid reader) and her six year old sister (who is learning to read). This book is sure to appeal to kindergarteners and first graders, and even older (or younger) children. $8.99 hardcover. Ten years ago, Emma Malloy fled Dublin and her abusive husband, Rory, for Boston, running for her life. There she found acceptance in a surrogate family, becoming not only close friends with the girls in the family, but a virtual sister. Her emotional and physical wounds have finally faded, and she feels she has found a purpose. Everything changes when her friends’ handsome and charming brother, Sean, attempts to woo her. With Sean O’Connor’s attention, her past rears its ugly head and it threatens to engulf her. Shame and fear threaten to destroy her. Believing she’s not worthy, Emma tries to push Sean away. But Sean is stubborn and refuses to leave. What can Emma do to make Sean see reason? Or—is it possible she believes lies? A HEART REVEALED is book two of the Winds of Change series by Ms. Lessman, but it easily stands alone. Emma is a very hurt heroine, destroyed and held together by sheer will power, as many women who’d experience what she has can attest. Ms. Lessman has a trademark for writing strong, courageous heroine’s who go against the grain. Women, who in the thirties, aren’t the quiet meek women who lived in horse and buggy days, but instead are the ones who bobbed their hair and their dresses in the roaring twenties. The ones who embraced the work-force and fought for women’s rights. These are a special breed of women, different than the average, and Ms. Lessman does them extremely well. If you like books set in the ‘20’s and ‘30’s then Ms. Lessman is an author you need to explore. A talented writer, she brings the characters to life. I shed some tears reading this novel. Don’t miss A HEART REVEALED. $14.99. 512 pages. While in the area, Gunner uncovers information pointing to the possibility that American POW’s are still being held in the North Korean controlled areas north of the 38th parallel. Gunner’s own grandfather may be one of the captives. Raised with a sense of responsibility and duty by (and for) his forefathers, Gunner desperately throws together his own “mission,” knowing full well that failure could cost him more than his own life. It could cost the lives of those around him, and potentially thousands of others, should hostilities be renewed between North and South Korea. Nevertheless, honor and courage combine in a novel that will stir your spirit and warm your heart as you follow Gunner and his new-found compatriots on a rescue mission that trumpets the sentiments of every red-blooded American: POW – MIA You Are Not Forgotten! I'd give this one 4 stars. Don Brown kind of dragged it out, and got overly technical at times in a very inconvenient way. He likes to use Navy documents as a means to introduce background material, but he's kind of clumsy at it. It ended very emotionally. In a good way. 336 pages. $14.99. Steven James keeps you coming back for more with another installment in his Patrick Bowers series. While investigating a double homicide in remote Wisconsin, Bowers unearths a conspiracy that ties together the Cold War of the past with the Middle East tensions of today. 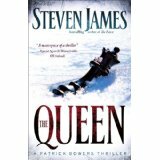 Weaving taut tension with winsome characterization, Steven James delivers yet another exceptional read to his fans . . . of which I am one! 517 pages. $14.99. Written in first person, from Diana’s point of view, she told the story of the struggles she and Ed had in trying to merge their families, the different temperaments of the boys, and what to do about the deceased spouse. Following each segment by Diana is a section by a marriage counselor (Marty) telling what Diana did right or wrong, and giving suggestions to others who are planning to or are blending two families. There are also random comments included through the book by other women who’d been there, telling their story. I enjoyed reading through WE’RE NOT BLENDED, WE’RE PUREED and recommend it to anyone who is considering blending two families—or have recently done it and want to have a quick “stepparent survival skills 101” class. $14.99. 228 pages. I write Christian fiction/nonfiction because time I feel my time on this earth is too short to waste with writing books that don’t introduce Jesus or encourage believers. Every time I think ‘this’ is the happiest day of my life I get another moment. I don’t think there can be only one happiest day of your life. Now I feel pressured with the, “When’s the next book coming out?” question. I just finished reading Deeply Devoted by Maggie Brendan, on kindle ap on my phone I’m reading Pride and Prejudice again. And on my nightstand waiting for tonight is Julie Lessman’s new book, A heart Reveled. I sure wish it was time for bed so I could start reading! I’m waiting for edits to come back for A Bride’s Dilemma in Friendship, Tennessee which will be released in May 2012. Anywhere near a beach with my husband. I don’t have a method. Something about the area intrigues me or a character that’s waiting for a starring role. Nate Berkus because my house needs help! As an interior designer I find his style appealing. I love black jelly beans, cotton candy and being driven places as I dislike driving. Doing it. Seriously, I find cleaning out the dust in corners easier to do than sitting down to start a new book. I overcome it by setting my timer for five minutes. Then when it goes off I picture my husband crawling on his knees to lay pavers in 100 degree weather. That usually keeps me in my chair writing. Learn the craft. Study, but give yourself permission to just write the first draft. We’re Not Blended-We’re Pureed, A Survivor’s Guide is my personal journey of blending a family, but what makes in unique is the follow up from a licensed counselor. It’s like you can read about real life and get an answer on how to keep it from happening to you or maybe you’ll find you’re doing everything right. Most important take away I’d like readers to get from this book is that your family may be blended but the family next door is having many of the same kind of issues you’re having. Don’t be afraid to reach out to other moms and dads and ask if they have any advice. Jaime has not been handling life so well since her mother was killed in a freak accident. She’s been on sleeping pills to try and cope, but when she needs her prescription refilled, there’s a different doctor seeing her, and he gently suggests that maybe she needs a different sort of help, something more than sleeping pills. Mattie is an Amish woman who has just miscarried yet another baby. She’s fearful, scared that something will happen to the one child she has, coddling Danny from even working with her husband, Sol. Sol tells her the boy needs to grow to be a man, but yet, he’s guilty of doing the same thing. A LANCASTER COUNTY CHRISTMAS is a sweet story about very real characters who are struggling to get things right. About letting go, and letting God. About even believing that a good, kind God could allow bad things to happen to good people. And it’s set in Lancaster County, during winter, with back-to-back blizzards coming in. A LANCASTER COUNTY CHRISTMAS started a bit slow as we were introduced to the characters, but it soon picked up. All of the main characters were very real and struggled with different issues, from Danny, to his cousin, Zach, and all four of the adults. The entire story took place during a three day time period, and there were six points of view included in it, telling the story from their stand points. There’s a saying, “you see what you see because you are where you are.” This is brought to life as you see the story through the different characters’ eyes. I thoroughly loved this book, and highly recommend it. Discussion questions are included at the end of the book. $15.99 hardcover. 200 pages. Enter to win your very own iPad Prize Package in Suzanne Woods Fisher ’s “Christmas in December” Giveaway! Enter at the link below and then be sure check out the blog tour – many of bloggers are giving away a copy of A Lancaster County Christmas! http://litfusegroup.com/blogtours/text/13425768 Winner of the iPad will be announced on 9/27 during Suzanne’s Facebook Party! To enter, click here http://litfusegroup.com/blogtours/text/13425768. But, hurry the giveaway ends on 9/26. Gracie Temple has grown to love the Mennonite community in Harmony, Kansas, but she didn’t think she’d ever leave Wichita until she met and fell in love with Sam Goodrich. Now she’s moving to her late uncle’s house to do freelance graphic design work. Her arrival in town is anything but smooth. A police officer pulls her over for seemingly no reason. A baby is found abandoned on a church steps, and when Gracie stops to investigate she is knocked unconscious. And when she arrives at her new home, someone is skulking around in the dark. SIMPLE DECEIT is the second book in Ms. Mehl’s Harmony series, but it easily stands alone. I didn’t like coming in on the middle of the relationship between her and Sam, so I think it might be better to read Simple Secrets first, so the romance is new and progresses more naturally. Written in first person, it is so smoothly done, I didn’t even notice what person it was written in until I went back to check something. Gracie is the only point of view character and the reader gets to know her well. If you enjoyed Barbour’s cozy mysteries when they were being released, then you will love SIMPLE DECEIT. It is written in the same upbeat style, yet with plenty of suspense to keep the pages turning. I did figure out who villain was early on, but that wasn’t enough to stop me from reading. $12.99. 320 pages. Alison Taylor has a passion for protecting children. One child, Kyle, stays in her memory as she rescued him from a meth dealer, and rescued his mom from a sorry life. Now the mother and Kyle had a new, good life, and Alison is proud of her success. When Alison’s brothers set her up with new detective, Mitch Morgan, the attraction is immediate on both sides. But Alison wants to take it slow, and Mitch is willing to do whatever it takes to keep her. DEADLY PURSUIT is the second book in Ms. Hannon’s Guardians of Justice series, but it easily stands alone. Readers will fall in love with Alison and Mitch, and cheer for them. There is some graphic violence in this book that disturbed me greatly. And I felt that the passion between the two characters was more forced than natural. I also figured out who the bad guy was before he was even introduced as a character in the book. But, DEADLY PURSUIT held my interest from beginning to end. It is a don’t-put-me-down type book. 4.5 stars. $14.99. 320 pages. Stress-Free Believers helps you dethrone the stress bully that is often caused by loss of employment, marital conflict, credit card debt, and countless other pressure points. Here is the battle plan you need to get harmful stress off your back so you can manage the tough times with composure. 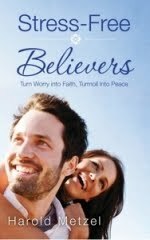 •Convert your thoughts from worry to faith. •Develop patience in the midst of chaos. •Take control of your thinking, emotions, and commitments. •Identify the tools God has given you to overcome stress. •Recognize the part you play in God’s comprehensive plan. •Allow God to work in your life as He did in the life of Jesus. This step-by-step guide shows how to reduce unhealthy levels of stress in each area of daily living. The objective is not just to overcome our ordeals but to do so without anxiety. 6.Do not worry about your life, what you will eat or what you will drink; nor about your body, what you will put on. (Matthew 6:25). Harold Metzel, a 30-year veteran as pastor, missionary, Bible College president and VP of a large charitable foundation in San Diego, currently coaches individuals and pastoral staff on ways to become even better stewards of what God has given. When visiting churches across the nation, he demonstrates ways to avoid unnecessary taxation, increase income using current assets, and provide a more effective inheritance. After counseling with many stressed-out believers, he now offers practical steps to bring stress back to a healthy level. For more information see: www.haroldmetzel.com or www.stressfreebelievers.com. Leave a comment to sharing how you like to beat stress and you might win the grand prize. In GRACE FOR THE GOOD GIRL Ms. Freeman addresses several issues. Like in chapter one, she addresses the issues of hiding. We want to be perfect, we want to be accepted, we want to be capable, or whatever, so we hide behind whatever façade we have. For instance, the pastor’s wife (and I know, I am one) has a public face – the one that is always smiling, always happy, always encouraging, and always put together, so no one would know that the two year old couldn’t find his shoes, that the teenagers had a rip-roaring fight over the bathrooms, and that your husband was growling at everyone. We have to be the perfect family. So, there is that mask. In another chapter, the topic is expectations. Which really could be the same as hiding—we have the expectations that we must strive to meet. We must meet those or we’re a failure. 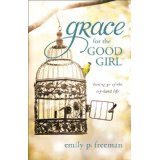 GRACE FOR THE GOOD GIRL is written in a conversational style that encourages the reader to let go and let God. It is perfect for group studies, and does include a few discussion questions at the end of each chapter, a small group leader’s guide, and extensive notes. $13.99. 257 pages. Ches Cholmondely and his sister Chelsea, along with two of their friends go across the street to the weather shop where Chelsea is showing them how to make Jack Frost paintings, when suddenly, the blue umbrella rips and Chelsea disappears into the umbrella! Ches is frantic, and Sky (the weather maker) suddenly becomes “under the weather”. But even more weirdly, Ches learns that someone is stealing time…a second at a time from every living person on earth. And when that second is stolen, bad things happen. Like airplane crashes. Chelsea’s disappearance. And more. Ches is on a mission to find his sister and to discover where time goes when it disappears. Solving one will solve the other. But how does one even begin? THE VIOLET FLASH is the sequel to The Blue Umbrella, and it does not at all stand alone. Readers must be familiar with the events in The Blue Umbrella to have some understanding of what is happening in THE VIOLET FLASH. I did read The Blue Umbrella, but it was so long ago, I wished I still had it in hand to reread before starting this book. I did eventually figure things out, and I did remember some characters. If you like fantasy, then THE VIOLET FLASH is a book to consider. Full of magic, unexplained events, and mystery, this is a book that will thrill any youth, male or female. The main character is male. I found the afterwords portion of the book especially interesting, as it included deleted scenes, and a glossary of words that might be unfamiliar to younger readers—which would be excellent in building their vocabulary. $9.99. 331 pages. Who are you really… beneath the surface? Let’s be honest. Do you have confidence in your own abilities? How do you define ourselves? With money, a nice home, beautiful things, or your looks? Do you struggle with insecurity and self-confidence? According to the author, women today judge themselves by what they see on TV. They never feel they are “enough” because they fail to recognize their identity is found in a deeper source. Karol Ladd will show you, in the pages of this book that when you understand your purpose and “walk with God-confidence” you will become what God intended you to be. English is my “thing” so I was really interested in the word studies there she dug into the root of different words to really show us what is meant by certain things. I found that quite fascinating. Ms. Ladd gives hints in the preface about how to find a group, and showed us how she formed her first group to study with, so even if your church doesn’t have small groups, you can still form a group of co-workers, neighbors, close friends, or whatever, and study it together. If you are looking to become more confident as who God made you to be (and who isn’t) then A WOMAN’S SECRET FOR CONFIDENT LIVING will be a book you should pick up. I read this through quickly for review, but this is a book designed to take slowly, with other women, so you can get the fullest benefit from it. There is also a DVD set that goes with it. There are plenty of lined pages at the back of the book for taking your own notes. $12.99. 220 pages. Ann Miller is heartbroken when her father refuses to allow her to marry her childhood friend, Eli, because of her young age. Eli is quick to move on to another, and Ann is convinced she’ll never find love. Will Hanby is an apprentice to a cruel saddle-maker. He’s worked for him for a couple years, and is barely surviving. Ann is sympathetic toward him, and tries to find help for him, but no one can do anything. Will’s master is asking him to damage Mr. Miller’s saddles, when Mr. Miller comes to Pittsburg to work at his saddlery. If Will disobeys, then he might be killed. But how can he be mean to a man that’s kind to him? And Ann… if Will ever finds his way to her, will she be waiting? FAIRER THAN MORNING is the debut novel by Rosslyn Elliot, and the first novel in The Saddler’s Legacy series. Loosely based on a true story, this is a heart-breaking story of love, loss, and cruelty. I wanted to do something to help Will and was glad there were a few people who were kind to him. At times I wondered what Ann saw in her first love, Eli, as he didn’t seem to be all that, and I hoped that somehow Will could cross the social lines—and a few states—to eventually find his way to Ann. Discussion questions and an interesting history lesson are found at the end of the book. $15.99. 393 pages. On a small farm in 19th-century Ohio , young Ann Miller is pursued by the gallant Eli Bowen, son of a prominent family. Eli is the suitor of Ann's dreams. Like her, he enjoys poetry and beautiful things and soon, he will move to the city to become a doctor. Ann travels to Pittsburgh , accompanying her father on business. There she meets Will Hanby, a saddle-maker's apprentice. Will has spent years eking out an existence under a cruel master and his spirit is nearly broken. But Ann's compassion lights a long-dark part of his soul. Through his encounters with Ann's father, a master saddler, Will discovers new hope and courage in the midst of tremendous adversity. Rosslyn Elliott grew up in a military family and relocated so often that she attended nine schools before her high school graduation. With the help of excellent teachers, she qualified to attend Yale University , where she earned a BA in English and Theater. She worked in business and as a schoolteacher before returning to study at Emory University , where she earned a Ph.D. in English in 2006. Her study of American literature and history inspired her to pursue her lifelong dream of writing fiction. She lives in the Southwest, where she homeschools her daughter and teaches in children's ministry. To celebrate the release of her debut novel, Fairer Than Morning, Rosslyn Elliott is giving away two fabulous prize packages. The first is brand new KINDLE in her Fairer Than Morning Kindle Giveaway. Then on September 20th she's giving away a $200 gift certificate toward a Custom-Made Historical Reproduction Dress (from Recollections) during the Fairer Than Morning Book Club Chat Party on Facebook! Sigh...romantic. Gabby is an accident prone little angel, about to be assigned to guardian angel duty on Earth. She is assigned to a little girl named Sophie who is somewhat of a tom-boy. When Gabby gets to Earth, Sophie is excited about going on a horse-back ride. But when the horse gets frightened and starts to buck, Gabby has her work cut out for her to keep Sophie on her horse and safe. When Sophie gets home that night, her mother tells her about how God assigns angels to watch over His children and keep them safe. GABBY, GOD’S LITTLE ANGEL is a sweet little story that teaches children about how angels watch over us. The colorful images are sure to capture children’s attention, and Sheila Walsh is a favorite here. My nine-year-old daughter squealed when she saw this book “Oh, Sheila Walsh! I love her books!” so if you have daughters ages five through nine, then this is definitely a book to pick up. $14.99 hardbook. 32 pages. How does this series differ from Gigi? Why did you write a new series of books for girls 3-7? There was such an overwhelming response to the Gigi series of books I wrote for girls ages 3-7, so I set out to develop a new character that young readers would embrace and delight in. How did you come up with the theme of God's love and ever-presence? I’m moved by God’s passion for children. We live in a crazy world, but we serve a God who loves us and our children with a relentless passion. What a gift to let our children know that they are never alone, that they are always loved. That is a story worth telling! Why did you want to write about angels from a child's perspective? Maggie Culpepper has grown up with William Dove, her best friend since they were seven years old. They know everything about each other, yet Maggie is taken by surprise when William wants to change the relationship from best friends to dating. Maggie is at first hesitant, but William talks her into it. Then everything changes. Maggie’s mother dies, and angry and bitter, Maggie dumps William and joins the Navy as a member of the WAVES. William still loves Maggie and writes her every day, but Maggie refuses to read his letters and starts dating another man. William refuses to give up hope. But will Maggie even consider coming home for Christmas? I had high hopes for this story. I absolutely LOVED William. He is a dream. I loved the setting, with a southern Christmas tree farm. I loved the time period—World War II—and the idea of seeing it from the point of view of a WAVES. But… that said, Maggie is a nasty, angry, bitter woman, very immature, and I couldn’t see at all what William liked about her. She was horrible, mean to William, and… Well, she is not a person I like. Even at the end of the book, it was all about her, not about anyone else. I wanted to like this book. I wanted to love it. But Maggie turned what could have been a five star story into a three. $12.99. 320 pages. Congratulations to Kathleen L. Maher for winning a copy of Candee Fick's book. Lydia Lee Was the oldest child of an improvised Amish family, having little but love, to see them through. She had ten younger brothers and sisters, and her father often moved them around, hoping for a new job, a better future. Liddie became used to going without food to feed her younger brothers and sisters. Liddie grew up during the Great Depression, then World War II. The story is quite sad in places, but interesting to read about how the Amish lived during that time when most everyone had it rough. The last few chapters of the book were enough to raise the book from a 4 star to a 5. I absolutely adored the story of Liddie’s romance with Freeman Coblentz; it was so romantic. Technically, this isn’t a memoir, as a memoir is written by the author about the author, but it isn’t as dull as some biographies. I’m going to have my daughter read it as a biography for a school report, but I’m labeling this a memoir though it technically doesn’t fit in there either. Ms. Younts calls it creative nonfiction. $10.00. 173 pages. Seasons is actually a little off the beaten path for me. I prefer to write fiction but this book is creative nonfiction. I chose to write this story and others I hope will be published someday also because I want the reader to experience truth in fiction and God’s amazing blessings in broken hearts. Well, I have to pick 3 days! The day I married my husband – my best friend – my true love. And the days my 2 daughters, Felicity & Mercy, were born. I think that publication, whether self or traditional, it builds your confidence. Knowing that I started and finished a project to TOTAL completion is an amazing feeling. I agree, it does do that. What are you reading right now? I just finished an ARC from award-winning author (and close friend) Allison Pittman…the 2nd in her SisterWife Series. I loved the book! I can't wait to read Allison's book. What is your current work in progress? I’m in the beginning stages of a book I call Crimson Rock. It’s a contemporary women’s novel. I am not sure I am able to talk much more about it than that. But I can say I’m very excited about this story! Well, I’m huge Ann Bolyen fan so I’d love to go to London & see everything about her…then my husband & I would LOVE to go to Hay on the Wye. It’s a small town (less than 2000 residents on the boarder of England and Wales. Imagine this: 30 major bookshops in one teeny town! ;-) A writer and book lover’s haven. The character seems to come first & then somehow it seems she picks the setting. 1-I cry at the Shamu Show at SeaWorld. 2-My 2nd daughter, Mercy, was born at home. My husband “caught” her. My midwife was about 5 minutes away from our house. ;-) Completely unforgetable and wonderful. 3-In my early 20s I acted in a small role in an indy film that won 3rd place at a small film festival. It was a blast! My fourth child was born at home and my husband caught her too. He says she's his baby. :) I completely understand. What are your hobbies, besides writing and reading? Photography, DIYing, sewing, and crocheting. What is your most difficult writing obstacle, and how do you overcome it. Getting through the middle!!! I allow myself to just write whatever I can to get through the areas I can’t seem to get right and then just go back and fix it later. Take learning your craft seriously. Be part of a critique group and attend as many good workshops & conferences as you can. As the oldest child in an impoverished Amish family, Lydia Lee knows little more of life beyond hard work, sacrifice and extreme hunger. Yet, even as a young girl she strives to be content with all God has provided. Against the backdrop of the Great Depression, Lydia’s childhood unfolds as her family struggles to survive, finding strength from their Amish faith. But, when tragedy strikes, that very faith is tested beyond what any child should have to endure. When all hope seems lost, Lydia is reminded that all things have seasons. The spring of her life has been spent planting prayers in the soil of sadness and heartache. Will she see a summer of true love? Will there be a harvest of happiness? I hope that everyone learns a little more about the Amish from Liddy’s experiences and learn that in all things there is contentment in the Lord. I truly hope that my readers will feel the hope that Liddy does by the end of the book. Even though this is creative non-fiction it reads more like a novel…YET it is so close to REAL LIFE and my grandma’s voice I feel like she’s talking to me throughout the entire book. I’m giving away one copy of Seasons. I will sign it to the lucky winner. Please let me know who to sign it to as well. I love a good story. I have lots of ideas. When an editor likes one, that’s what I write. But I think, as varied as they are, all have in common a thread of hope and often forgiveness. Those are very important topics to me. Probably my wedding day. That was a long time ago, but it marks the beginning of a great partnership. I’m now the main breadwinner of the family. That’s kinda scary. It means I spend a lot less time outside than I used to, too, and a lot less time on hobbies. But I love it anyway. I’m writing another western, but this one’s much lighter in tone. Lady in the Making will be the third in my new Prairie Dreams series. In it, a lady with a past has to convince a gentleman that she really is a lady now. Any place with lots of history. I’d love to see Maachu Pichu, for instance. Ruins rock. Sometimes it’s chosen for me. With Captive Trail, the first thing we knew about our series was that it would be set in Texas. Other times I fall in love with a place and want to put some characters there. I have several books set in Maine, because I love it and know it so well. My daughter who lives in England. We hoped to go and visit her this year but were unable to do that. I used to shoe horses; I homeschooled my six children; and I am a stroke survivor. Reading, genealogy, logic puzzles and ciphers. In the past I did a lot of needlework, but I haven’t had time for that lately. Lack of time for the writing-related tasks such as reading galleys, critiquing for friends, filling out art sheets, and promoting my books. I just do what I can and accept that I’m not superhuman. Read a lot. Write something every day. And grow a thick skin, so you’re ready to accept constructive criticism. With some detective work, Ned discovers Taabe Waipu’s identity. He plans to unite her with her family, but the Comanche have other ideas, and the two end up defending the mission station. Through Taabe and Ned we learn the true meaning of healing and restoration amid seemingly powerless situations. Captive Trail is second in a six-book series about four generations of the Morgan family living, fighting, and thriving amidst a turbulent Texas history spanning from 1845 to 1896. Award-winning authors Vickie McDonough and Darlene Franklin also contribute to this series—we have two books each. And each book can be read on its own. Forgiveness and reconciliation are vital in this book. And I hope they enjoy the story! Are you better at forgiving or at apologizing? We’re giving away a copy of Captive Trail. Hailee Annigan has searched for her two little brothers, Philip and Reuben, ever since she was freed from the Cincinatti “sanctuary” she was raised in after she was caught stealing. She’s always wondered what happened to them—even now, when she goes to Montana after she’s hired as teacher. Pastor Nate Adams originally came to Montana with his grandmother, and even as a young boy he knew he wanted to live there someday, away from the busy streets of Boston where he grew up. And when he’s older, he is offered the job as pastor in the community he and his grandmother visited so long ago. When Nate and Hailee meet, she almost literally falls into his arms. Their attraction is immediate. But with her brothers still missing, Hailee doesn’t feel free to find happiness. Will she ever find her brothers? Or will she allow herself to fall in love if she doesn’t? HAILEE is the third and final book in Ms. Zeller’s Montana Sky series, but it easily stands alone. Several characters from previous books do make an appearance in this book, as do a host of other interesting and realistic characters. I especially loved the nosy Lucille. Penny Zeller has penned a heart-warming conclusion to her Montana Sky series with HAILEE. This book grabbed my attention from page one and kept it as I prayed for Hailee not only find her two missing brothers but also to find happiness and love in Montana. Ms. Zeller doesn't disappoint with her historically accurate romances. If you are looking for a good historical romance, then be sure to pick up a copy of HAILEE. $9.99. 311 pages. Besides when you came to know the Lord, what is the happiest day in your life? The happiest days of my life were the day I married my husband and the times we became parents to our two daughters. How has being published changed your life? Life is a lot busier! I also discovered rather quickly that the hard work begins after publication. What are you reading right now? I am reading Awakening by JoAnn Durgin and A Summer in Oakville by Shellie Neumeier and Lisa J. Lickel. Both are awesome reads! I am also reading and studying 1 Thessalonians in the Bible. What is your current work in progress? I am currently working on book two in my second historical romance series, which takes place in the post Civil-War era. What would be your dream vacation? Hmmm….well there’s a four-way tie of places I would love to visit for a dream vacation with my family: Hawaii, Alaska, Hilton Head Island and Prince Edward Island. How do you choose your settings for each book? I choose places that intrigue me or places that I have visited. I am a very visual person, so if I have visited a place, I can easily integrate my characters into that setting. If you could spend an evening with one person who is currently alive, who would it be and why? My husband, Lon. He’s been traveling a lot these past few months for work, so I’ve really missed him and would look forward to an evening with him. What are your hobbies, besides writing and reading? I also enjoy playing volleyball, gardening, camping, hiking, canoeing, and spending time with my family. What is your most difficult writing obstacle, and how do you overcome it? I would say my most difficult writing obstacle is setting priorities and sticking to them and not wasting time on less important things on my “to-do list.” To help myself overcome that obstacle, each morning before I climb out of bed and face a day of mothering, chauffeuring kids to after-school events, housecleaning, volunteering, and writing books, I ask the Lord to prepare my heart. I ask that He guide my day, that I would use my time wisely, and that I would get accomplished only what He would have me do that day. Tell us about the book. For years, orphan Hailee Annigan was just a ragamuffin in the Cincinnati streets, stealing food to keep her two younger brothers fed. Her thievery landed her in a home for delinquent youngsters, where her life was changed, thanks to her teachers. Now, nineteen-year-old Hailee excitedly heads to Montana to be a teacher, yet she's still plagued by her shameful past and the fear of never seeing her brothers again. Based on his upbringing in high-society Boston, no one would have guessed that Nate Adams would attend seminary and become a church pastor in rugged Montana. Even now, Nate's parents refuse to put aside their own plans for his future and accept his calling. What do you want readers to take away from the book? My passion is to write books that impact lives for Christ. Readers can expect to share in Hailee’s pain and sorrow, as well as the joy she experiences. They will watch as her faith wavers and her heart breaks at the losses she experiences in life. They will share with Nate as he struggles to release to the Lord burdens he was never meant to carry. My books are character-driven, and as such, throughout the book and with a variety of characters, readers will catch a glimpse of struggles with forgiveness, Salvation, rededication to Christ, and the hope of a new life. What one question would you like us to ask readers? Which character in my Montana Skies Series so far is your favorite? If you haven’t yet read any books in the series, what character would you most like to meet? Tell us about the giveaway you’re offering. I am giving away a personalized copy of Hailee. If the winner is a U.S. resident, they will receive the paperback version. If the winner resides outside the U.S., they will receive the ebook PDF version of the book. On Facebook at http://www.facebook.com/pages/Penny-A-Zeller/96391560959?ref=ts where I post updates about new books, giveaways, events, and Just-for-Fun Fridays.